i’m not sure how it should be, but it seems like i’m going in the direction of a wide round one. working with the picture in photoshop is also helpful in trying out different ideas. also – i’m realizing that the vest could be a tad slimmer… maybe i’ll have to make someone else wear it 🙂 and hopefully blocking/ironing it will make the pattern more even. 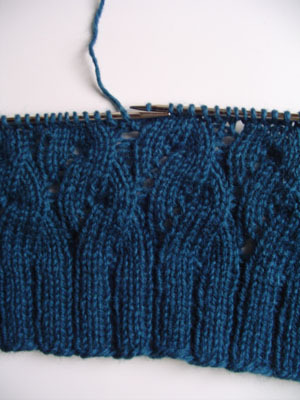 it has grown a little bit in the last week… the way the cable pattern moves a little to the left is a bonus – i didn’t see it coming, but am happy about it 🙂 i think it will make an interesting touch to this long vest. i have decreased the number of stiches by 18 over the last 6 reports to make it a fitted fit, and think i have succeeded in making it invisible. 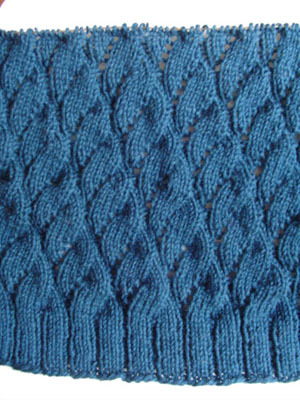 now, doing an invisible increase will be the next challenge… i do plan on posting the diagram for the cable/lace pattern soon.